Home shoppers typically visit several open houses and home viewings before making offers on properties. This initial shopping period is especially exciting for first-time home-buyers, and often emotionally-charged since purchasing a home is generally the largest purchase in a buyer’s lifetime. Making the right decision is crucial since mortgages commit buyers to potentially 30 years of payments. How can buyers ensure they’re making the best home buying decisions? First, buyers should do the math to calculate affordability and then hire trustworthy agents, lenders and inspectors to guide their buying processes. Each professional plays a critical role in informing buyers of their options to help them make educated decisions for their personal circumstances. Once shoppers identify homes they can visualize living in, they work with their lenders and real estate agents to make fair offers. Then it becomes a waiting game to find out whether sellers accept their offers or not. In competitive markets, this shopping process can take months and buyers may lose their analytical perspectives of properties after making multiple unaccepted offers. When offers are accepted, buyers work with lenders to solidify loan options and mortgage terms. Then, buyers hire inspectors to examine properties for damages and significant issues. Agents can help negotiate with sellers regarding repairs. It’s not uncommon to include addendum’s to purchase agreements during the inspection process to cover any unforeseen damages. The below information outlines what to look for at the final walk-through. After signing the purchase agreement, the buyer has the opportunity for a final walk-through of his or her soon-to-be home. Some walk-throughs require buyers to sign addendum’s when it’s complete, others are more casual. Occasionally, buyers and sellers meet at the final walk-through, and sometimes only buyers and their Realtors® attend. After all the procedural steps of buying a home are complete, it’s easy to let excitement overwhelm and begin thinking about furniture design rather than maintaining a critical eye on the condition of the home. The walk-through is the opportunity for buyers to inspect the repairs sellers agreed to make before closing, check the functionality of home features, and confirm the state of properties aligns with the terms of their purchase agreements. Buyers should bring their purchase agreements to their walk-through in case they need to refer to contract terms during their analysis. It also helps to have a checklist to mark while reviewing property conditions, to avoid skipping important elements. 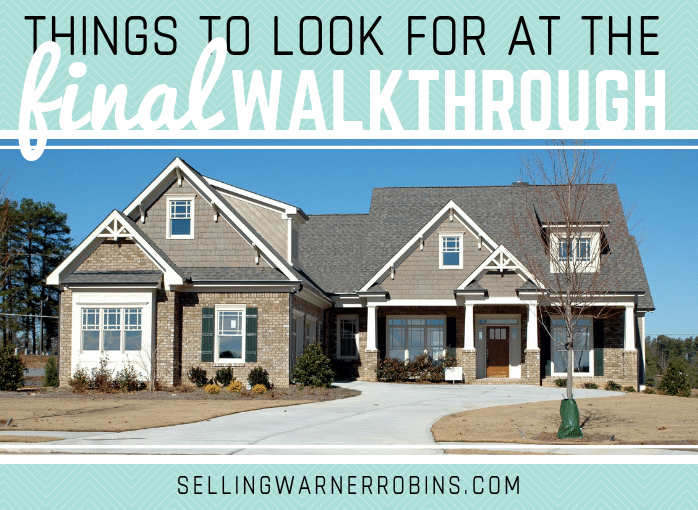 Here is a detailed list of features buyers should examine during their final walk-throughs. Often times, buyers negotiate sale terms to keep new appliances, light fixtures, window treatments and other installations as part of their purchases agreements. Buyers should begin their walk-throughs by confirming all agreed upon features are still present and in the same condition as the time of inspection. Review property exteriors to check for features such as play structures, hot tubs, compost barrels and plants. Sellers sometimes dig up bushes or small trees to replant at their new properties. Further, check to see if any items were left behind that were not indicated in the negotiated terms. It’s common for sellers to leave boxes in the attic, or old work supplies in the garage. Hazardous materials such as paint cans should be removed by sellers before closing. When seller furniture is moved out, it’s much easier for buyers to recognize damages they may have overlooked during their initial inspections. Review surfaces, ceilings, walls and floors for any new damages such as mold, warped flooring due to water damage or cracked windows and walls. Look for owner’s manuals to accompany all appliances and remote controls for ceiling fans, lighting, sound systems or any other features. Buyers agents can require sellers to meet the terms of the purchase agreement prior to closing or renegotiate new terms to cover costs of repairing any missing features or damages found during the final walk-through. If sellers do not meet the terms of their contract, buyers can walk away from their offers. The final walk-through is the last chance for buyers to critically review properties before signing closing paperwork. Buyers who use the opportunity wisely and avoid emotional fatigue tend to have the highest probability of buyer satisfaction. Thank you to Tali Wee at Zillow.com for graciously sharing her expertise on this article and be sure to visit Zillow’s affordability calculator to determine how much house you can afford! Great job with the article Anita. 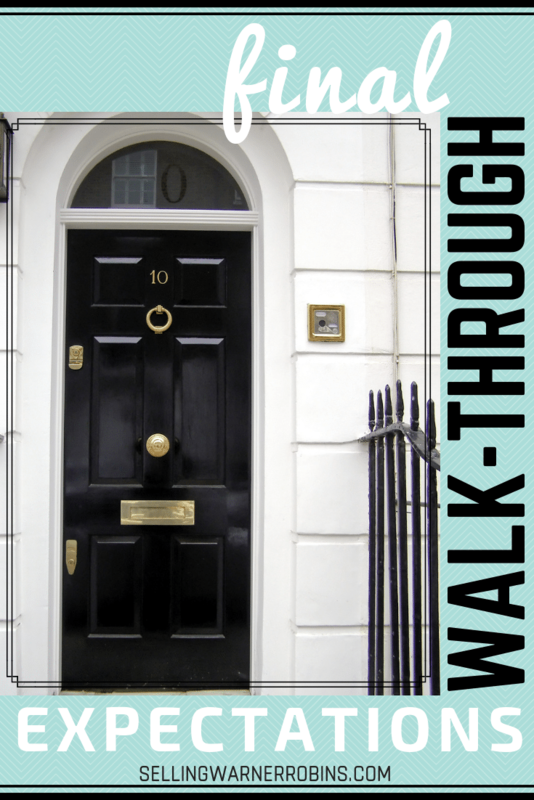 A final walk through is a vital part of a real estate transaction. Thanks Bill. Buyers need to have one regardless of the type of home they are buying. Great Advice for home buyers! I really like the list and thank you for the wisdom. MY question is about the home inspection which the buyer pays for and really covers all the above mention. Most home inspection are costly. Please share your thought on this. In my area they are $300+. That buys a lot of peace of mind!